Sometimes after a long day of standing, working on the farm, or in the garden – or even just shopping, all I want to do is lie on the couch with my feet up. It just seems like the natural response to tired feet. But I’ve found something better! Peppermint is an excellent aid to circulation, which is part of what makes it such an invigorating herb, and rubbing peppermint essential oil into your feet will do worlds more good than just “putting your feet up”. Combine peppermint essential oil with this foot cream, and you end up with the most luxurious and healing foot cream you could ask for. I love how fresh and cool this cream makes my feet feel after a long day! 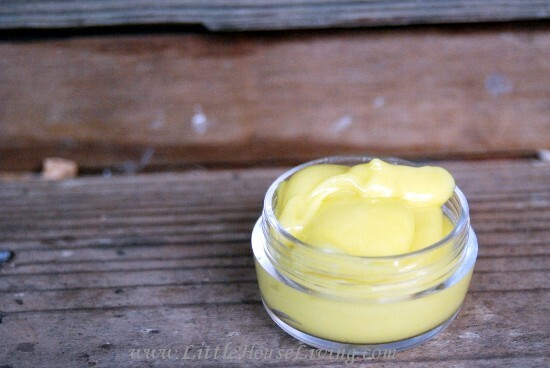 The oils in this cream are both skin nourishing and healing, helping to prevent dry, cracked heels, or helping to heal those that are already cracked and dry. This cream is amazing all on it’s own, but for an extra pampering touch, soak your feet in a warm epsom salt bath for twenty minutes, and pat dry before apply your peppermint foot cream. You’ll be amazed at how soft and fresh your feet feel afterward! Since I have two little people underfoot (literally! ), I like to do my foot soaking out on the porch where they can splash and stomp in the water without stressing momma out. There’s no reason being a mom has to keep us from pampering our tired feet! 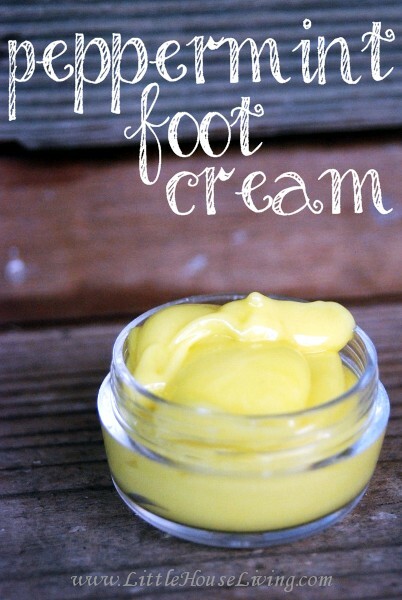 So take a few minutes to whip up this refreshing, minty foot cream – you’ll be glad you did! 1. In a double boiler set up, melt shea butter and coconut oil over gentle heat. 2. Add olive oil and let cool to lukewarm. 3. Stir in the peppermint essential oil. 4. Beat until light colored and creamy using rotary beaters, a stand mixer, or an immersion blender. This should take less than five minutes. Store in container of your choice. The consistency of this foot cream is perfect for a pump bottle in my 86º kitchen. If you keep your house 73º (or cooler), you’ll want to store it in an open top container since coconut oil will harden up at that temperature. Have fun pampering your feet! Looking for a recipe that is more of a scrub? 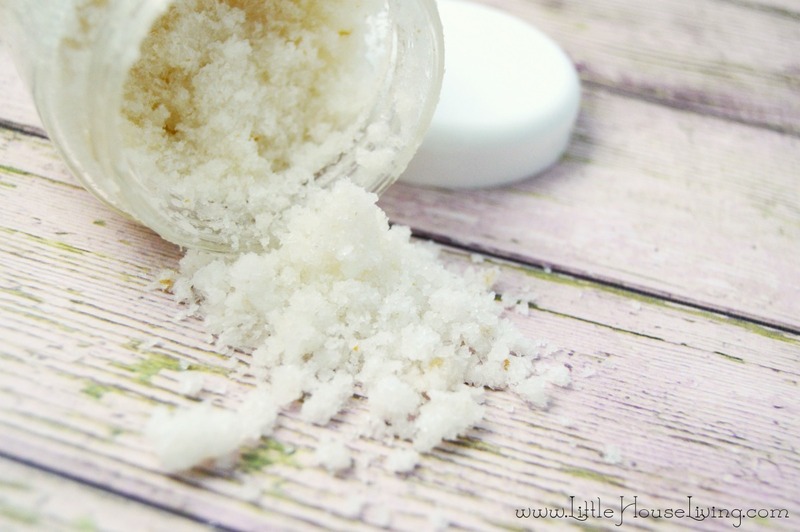 You would love this DIY Sugar Scrub and this Homemade Hand Scrub for Gardeners! Find even more Peppermint Oil Uses here! 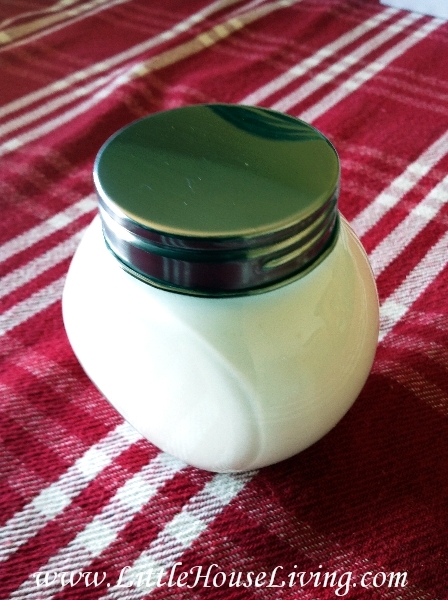 Do you think you will whip up some of this Peppermint Foot Cream? Would you add any other essential oils? Make Your Own, Stretch It! I have all of the ingredients.. and some tired feet! Going to make this and use it this evening, Thank you! Just pinned it for a homemade Christmas! Can you suggest an alternative to the shae? Also, I have a mint blend essential oil called Candy Cane. Do the properties of peppermint make a pure oil more desirable? You could use Cocoa Butter, Mango Butter etc. . . . If your Candy Cane blend is made of 100% essential oil then you can use that if you choose. If it is a “fragrance” blend go get some pure essential oils for use on your body. I am going to have to pick up some shea butter so I can make this and test it out. Sounds like a great recipe and I do believe I’ll make a batch for the Christmas gift baskets. Pinned! This looks perfect for tired feet! Thank you for sharing at The Wednesday Round Up! We hope to see you back next week! I will have to try this for my poor feet. I love peppermint oil–I use it frequently! Thanks for posting! Stopping by from the Lets Get Real link party. Have a good one! I’ve been putting Lemon EO on m feet for spider veins. And rub in some Lavender on the bottoms for calming down at night, why not peppermint too? Perfect for summer when those feet are always on display with sandals or flip-flops. I could definitely use some of this. Thank you for linking at the In and Out of the Kitchen Link Party. Hope to see you again next week. Peppermint is great for feet. I would add Lemmon or lime for hands/body. This sounds really nice, I love peppermint! So pinning this to make. I use stuff on my feet all the time. This sounds great!! My footsies could use some of this!! This looks great! Love peppermint. Also, love your name. I have a daughter named Elyse. Have a beautiful day! This would be such a fabulous gift! I try to find raw and unrefined shea butter for my projects. I can’t remember exactly how much you will get from one pound but it should last through several projects for sure. I made this tonight but it never firmed up. Any suggestions? Thank you! Is your home warm? Usually after I make things it will take a good day or two to firm back up. Thanks for the reply! It’s about 68 degrees in the house, so not super warm. After I posted this question, I did some more digging and found other folks who were having the same problem. I decided to try the advice given to them – which was to freeze the mixture for 10-20 minutes and try whipping it again. So I did this and it worked like a charm. This lotion is so light and creamy. I can’t wait to give it to my friends and family as a Christmas gift! Thank you SO MUCH for the recipe!!!! Awesome, I’m glad you found the solution! I am also having trouble with it whipping and firming up. I tried it by the book at first, and I am now reading about freezing it for 10-20 minutes so I hope that helps. Do you find that it separates again after whipping and putting in a container or once firm and whipped it remains that way? How warm is your home? Anything with coconut oil will become quite soft over 75 degrees. I would recommend keeping it in the fridge after whipping it or adding a little more shea butter and a little less coconut oil to help keep it firmer. Mine came out fabulously but when I rub it on my hands its like all oily, any suggestions? Anything with coconut can be slightly oily, sometimes I dab off the excess oil just slightly with a dry washcloth after using. Can I put Tea Tree essential oil with the peppermint? What is the shelf life of such a product? Do I need to add any preservative to make the shelf life longer? Yes, you could add in tea tree oil as well. I’ve found that most homemade products like this last at least 6 months to a year. Just make sure to store them in a cool, dark, dry area. I get extra jars for storage from Hobby Lobby and Mountain Rose Herbs. I haven’t made it yet but I have a grandmother that’s in her 60s I take care of her because she has hypertensive stage blood pressure so I try to get her to relax a lot.her feet are always swollen she is always in pain sometimes to where she can’t stand for long or even walk. My question is along with the peppermint oil can I add eucalyptus oil and lavender oil? or do you think that will be to oily? You can always try different oils to find a balance that works well for you. A few drops shouldn’t make it too oily. I’m having trouble~ I followed your instructions to the letter and it’s not thickening! 🙁 it is staying liquid in the blender- I first tried the Emerson blender and not the standing one and it won’t budge… Help please?? I am looking for a not so oily condition. Why is the result yellow? I wanted it to pink. Hi. How long would this cream keep for and what can you add to improve use by date? Hi! I just made a double batch. I too had a solidifying issue, so I put it in the freezer for 10 min, rewhisked, then again froze for 30. Now out on the kitchen counter. I used eucalyptus oil instead since my peppermint is in the mail. Hope it gets my feet to relax!! Hi there i’d just like to say that I am on my 2nd batch and can not get enough of this stuff. I’m a Yoga and Dance instructor and looking after my feet is super important to me. I have been using shop bought products for years but moved to Portugal and was finding them hard to find or just majorly expensive. Merissa, this sounds wonderful! And thanks for the specific information about temperatures and containers for storing. My feet would love this right now! I love peppermint. I will try this, thanks for sharing this. Does it feel good and work well if you don’t soak your feet?